Chapter 9: Student complaints. This expert recommendation is part of a series on helping students engage productively in active learning classrooms. While active resistance among students is relatively rare (Nguyen et al., in press; Nguyen et al., 2016), sometimes students do complain about active learning techniques (Seidel and Tanner, 2013; Ellis 2015). This chapter focuses on addressing some common student complaints in active learning classrooms. While student complaints may be challenging or even hurtful to hear, they offer valuable opportunities for you to learn from your students, and possibly improve the overall engagement of the class. The goals of this project is to identify and disseminate strategies that instructors use to engage students in active learning classrooms. This project arose from the Framing the Interactive Engagement Classroom project, led by Stephanie Chasteen (University of Colorado Boulder), with collaboration from Jon Gaffney (Eastern Kentucky University) and Andrew Boudreaux (Western Washington University). Many thanks to reviewers Rebecca Ciancanelli and Jenny Knight, plus undergraduate assistant Maya Fohrman. This work was generously supported by the University of Colorado Science Education Initiative and the University of Colorado Center for STEM Learning, via a Chancellor’s Award. Please contact Stephanie Chasteen with any comments or questions. You might hear a few vocal complaints from students. Some comment complaints include, “the professor isn’t teaching anything,” “We have to teach ourselves,” “The class is too much work,” “We’re wasting time,” or more personal attacks on the instructor. These complaints can be demoralizing, and seed doubt in the rest of the class. Such complaints may be specific to the student (what is their learning approach? ), or the institution (how frequently is active learning used?) or the instructor (how experienced are you with active learning?). Often, such initial pushback can decrease over time, as the course structure becomes more normative, and initial difficulties are addressed (e.g. Breslow 2010, Koretsky and Brooks 2012). Here are some strategies for addressing such vocal complaints. It can be useful just to listen to students the first time you hear complaints, and respond positively (e.g., “I hear you. It can be challenging to learn in new ways.”). Resist the urge to preach to students. Listening can help you better understand the problem, as well as supporting a positive relationship with your students – where they may be more receptive to your recommendations. A common mistake in the face of complaints is to respond in a controlling, authoritative manner. This undermines the foundation of a cooperative class (Reeve, 2009). See Chapter 3: Motivation for discussion of how a controlling manner can backfire when trying to support students’ internal motivation, and Chapter 4: Class Community for discussion of the importance of giving students a voice in order to generate a positive relationship with students. In general, be careful of telling students to “eat their vegetables” (i.e., engage with the active learning because it’s good for them), as this undermines students sense of control. To find out how widespread the problem is, you might use clicker questions or an online survey to solicit ideas from the class as a whole (also see some suggestions in Chapter 5: Assessing Engagement.) Listen and try to understand the problem from the student perspective. For example, if students complain that the questions are vague, maybe you need to clarify the prompts in your activities. If they complain that you’re not teaching them anything, clearly identify the goals of the activity, and include reflective discussion about learning gains afterwards. If students complain that the course is too much work, make sure the learning benefit is clear (see Chapter 2: Metacognition). Use student input when appropriate, but stay the course and trust your curriculum; you should expect some bumps along the road as you try something new. See Richard Felder’s article “Hang in There!” for some more ideas (and reassurance!). Let other students make the point for you. Set appropriate expectations for the course. Reassure students that learning is hard. If students are off-task during activities, it may be that they aren’t willing to expend effort and risk failure (Boekaerts, 2010). Acknowledge that working on such tasks may seem unstructured and challenging (Patton, 2010). Clearly indicate the point of the activity and give students a clear sense of direction. Use non-threatening feedback, and help students develop a mastery orientation towards their work, seeing learning as a process (see Chapter 2: Metacognition). Active resistance to interactive engagement is relatively rare (Nguyen et al., in press; Nguyen et al., 2016), but resistance and low evaluations can happen (Seidel and Tanner, 2013; Ellis 2015; Slezak, 2014; Pepper, 2010). You might experience "implementation dips", where student evaluations decline during first implementation, and then recover over time (Allen, Wedman and Folk, 2001). However, please remember that student evaluation results should be taken with a grain of salt, as they are not necessarily measures of student learning. Student learning has not been shown to be well correlated with student evaluations of teaching effectiveness (Uttl, White and Gonzalez, in press). Student evaluations tend to be higher in courses where they get higher grades, but not necessarily in those that promote deeper learning (Carrell and West, 2010). Also, student evaluations are known to be biased against female and minority instructors (Centra and Gaubatz, 2009; Miller and Chamberlin, 2000; Potvin and Hazari, 2016). Use alternative measures of teaching effectiveness. To document your teaching effectiveness (especially for promotion or tenure), gather alternative data on student learning (see PhysPort’s Assessment page for concept inventories, interactive teaching, and student attitude assessments). 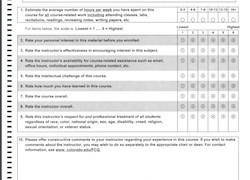 If you expect evaluations to drop in your course, you might ask your chair in advance not to consider the student evaluations for the term in your portfolio. Be proactive to make sure that your chair understands the risks associated with using active learning (especially for a junior faculty member). Invite your chair and/or a senior faculty member to visit your class and provide feedback. In this way, students will not be the sole source of course evaluation. Use a mid-semester survey to find out mid-stream what students don’t like about the course, and try to address it. Even a simple form such as Stop-Go-Change can provide useful information. Or, you could hold a focus group with students (or have your teaching and learning center to do for you) to hear about how students would like to learn, and then sharing this information with the class as a whole. Listening to your students, and addressing problems early can increase students’ sense of autonomy (see Chapter 3: Motivation), and their trust in your good will (see Chapter 4: Class Community). While you likely don’t want to stop your use of active learning due to poor student feedback (after all, you have good reasons for using these techniques, you might increase students’ sense of autonomy (see Chapter 3: Motivation) by providing them some choices along the way. For example, let students choose among three topics to engage in through active learning. Or if they complain about exam grades, offer them an extra credit assignment. Find out where problems are and address them. Don’t do too much, and stay in touch with your teaching instincts. One common problem faced by instructors when first embracing active learning is trying to do too much at once. This can lead to negative student evaluations because you’re scrambling to keep up, and students sense it. Such overwhelm reduces student confidence (Slezak, 2014) as well as limits the degree to which you can adequately plan each activity for success. Consider rolling out active learning in smaller pieces so that you can master each part, or piloting the course as a summer section, especially if low evaluations could have significant career implications. While active resistance among students is relatively rare, sometimes students do complain about active learning techniques. Here are some ways to address some common student complaints in active learning classrooms. While student complaints may be challenging or even hurtful to hear, they offer valuable opportunities for you to learn from your students, and possibly improve the overall engagement of the class. You might hear a few vocal complaints from students. Some comment complaints include, “the professor isn’t teaching anything,” “We have to teach ourselves,” “The class is too much work,” “We’re wasting time,” or more personal attacks on the instructor. Often, such initial pushback can decrease over time, as the course structure becomes more normative, and initial difficulties are addressed. Try to identify the problem. Let other students make the point for you. Set appropriate expectations for the course. Reassure students that learning is hard. Active resistance to interactive engagement is relatively rare, but resistance and low evaluations can happen. Please remember that student evaluation results should be taken with a grain of salt, as they are not necessarily measures of student learning. Use alternative measures of teaching effectiveness. Find out where problems are and address them. Don’t do too much, and stay in touch with your teaching instincts. Ellis, D.E., What Discourages Students from Engaging with Innovative Instructional Methods: Creating a Barrier Framework.Innovative Higher Education. 40(2), 111-125 (2015). Potvin and Hazari, Student evaluations of physics teachers: On the stability and persistence of gender bias, Phys. Rev. Physics. Education Res., 12, 020107, (2016). Coral Pepper, ‘There’s a lot of learning going on but NOT much teaching!’: student perceptions of Problem-Based Learning in science, Higher Education Research & Development. 29(6), 693-707, doi: 10.1080/07294360.2010.501073 (2010). Centra, J. A., & Gaubatz, N. B., Is there gender bias in student evaluations of teaching?, Journal of Higher Education. 71(1), 17–33 (2000). Miller, J., & Chamberlin, M., Women are teachers, men are professors: A study of student perceptions, Teaching Sociology. 28(4), 283 – 298 (2000). Uttl, B., White, C.A., Gonzalez, D.W., Meta-analysis of faculty's teaching effectiveness: Student evaluation of teaching ratings and student learning are not related, in Studies in Educational Evaluation (in press). (2016). Witt, P.L., Wheeless, L.R., & Allen, M., A meta-analytical review of the relationship between teacher immediacy and student learning, Communication Monographs. 71, 184-207 (2004).